Kit includes battery, 3-6 hr. charger, 2 bits, 5 drill bits and case. Built in bubble level for accuracy. Comfort grip with no slip texture. 4.5 amp motor, 0-1400 RPM, increases power and speed. 3/8" keyless chuck enables quick and easy bit change. 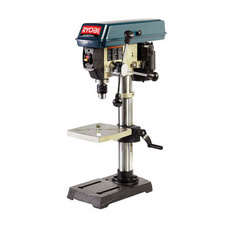 2 built-in levels for vertical and horizontal applications improves drill/driving accuracy. includes carrying case. 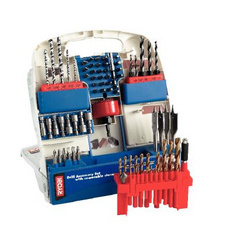 22 Piece Drill Accessory Set. Great project set for "home owner", includes 1/4" autoload connector, compact screw guide, seven 1/4 " titanium hex shank bits sizes: 1/16, 5/64, 3/32, 1/8, 5/32, 3/16, 1/4, six assorted 2" power bits, 1/4 to hex square adapter, six assorted 1" insert bits. Total 22 pieces. Powerful motor outputs over 850 in/lbs of torque for the most demanding driving applications. 1/4'' quick coupler for easy bit changes. Unique impact mechanism designed to help drive long screws and lag bolts. Die cast front gear housing increases tool longevity. Conveniently located forward/reverse selector. Variable speed trigger helps assist in screw start-up. Overmold cushion grip for user comfort. Convenient bit and driver storage on the base. of the drill. Includes 2 accessory bits and a plug-in lanyard. BATTERY AND CHARGER SOLD SEPARATELY. • Powerful motor outputs over 850 in/lbs of torque for the most demanding driving applications. 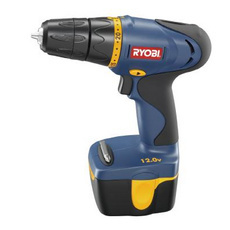 • Unique impact mechanism designed to help drive long screws and lag bolts. Packaged in a heavy-duty rollable mat. Has rubber non-slip grips and eyelets for hanging on the wall. 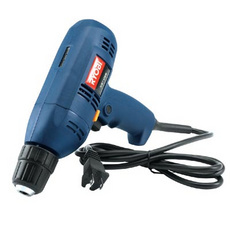 Includes drill bits and driver to cover all projects in wood, metal, plastic, and masonry. The location or accessories is clearly marked on the mat. Heavy-duty induction motor for long lasting performance. 12 speeds match the speed to the project. Belt tension release lever assists in faster speed changes. Adjustable table for addressing the quill at any angle. Table clamp ledge assures secure clamping surface for the work piece. Bores holes to the center of a 10 in. W stock. 1/2 in. chuck. 5 speeds (540-3600 rpm.) 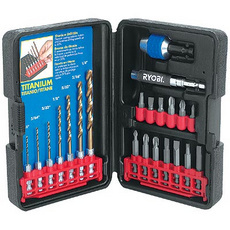 for use with a variety of drill bits & materials. Adjustable depth lock with 2 - 3/8 in. stroke allows for precise repetitive cuts. Accepts mortise attachments. 1/4 hp induction motor for heavy duty operation. 40 Piece Drill Accessory Set. Great all inclusive set for "Pro "or the "do it your selfer". 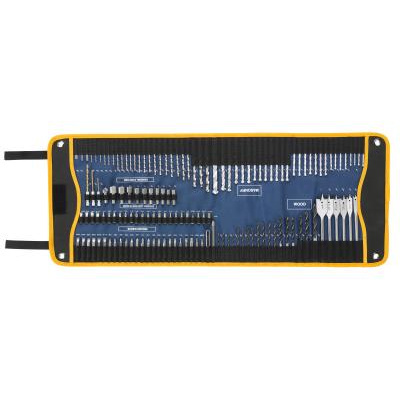 Set includes 1/4" connector, seven 1/4" hex shank titanium drill bits: sizes 1/16, 5/64, 3/32, 7/64, 1/8, 5/32, 3/16, compact screw guide w/P2 insert bit, drive body, reversible countersink insert #8x7/64, two 2" power bits, three magnetic nut setters 1/4x1/4, 1/4x3/8, seventeen 1" insert bits. Total of 40 pieces. A keyless chuck enables quick and easy bit changes. The forward/reverse selector is conveniently located for inserting and removal tasks. The variable speed switch controls drilling/driving tasks from a slow start to a fast finish. On-board magnetic storage for quick acces to your driving bit. 24 clutch positions virtually eliminate screw stripping by adjusting for various materials and driving depths. Built-in bubble level improves drilling/driving accuracy by identifying the proper 90 degree angle. The compact center handle design with power grip overmold maximizes user comfort. 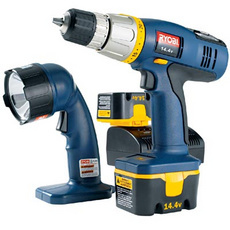 Includes 2 batteries, charger, 26 piece bit set, 1 double ended bit, Stud Tech with battery, and case. • Keyless chuck enable quick and easy bit changes. • Forward/Reverse selector conveniently located for inserting and removal tasks. 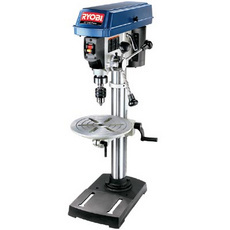 • Variable speed switch controls drilling/driving tasks from a slow start to a fast finish. • On-board magnetic storage for quick access to your driving bit. • 24 clutch positions virtually eliminate screw stripping by adjusting for various materials and driving depths. • Built-in bubble level improves drilling/driving accuracy by identifying the proper 90 degree angle. • Compact center handle design with power grip overmold maximizes user comfort.